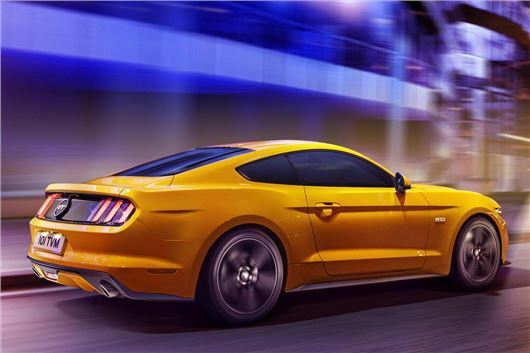 Ford has released the pricing and specification for the UK’s Mustang, and in doing so confirmed it as most probably the best value pound-per-horsepower car on sale today: the 418PS 5.0-litre V8 version is only £32,995. Two engines are available, with a 314PS 2.3-litre EcoBoost petrol sitting below the V8 and giving the Mustang range a £28,995 starting price. It’s on sale now, with first deliveries expected in October. To put those numbers in simple context, the 418PS, 5.0-litre Ford Mustang costs £1700 less than the 143PS, 2.0-litre diesel BMW 418d M Sport. And you could buy one of each version (EcoBoost and V8) for about the same price as an Audi RS5. This is the first time that the Mustang, an American icon for the last half-century, has been officially available in the UK - and this latest version was developed with the European market in mind. Both engines are available with a six-speed manual or six-speed automatic transmission, and in fastback and convertible body styles; the most expensive Mustang is the 5.0-litre automatic Convertible, which is £38,495. Every Mustang features 19-inch alloy wheels, LED tail lights, xenon high-intensity discharge headlamps, dual-zone climate control, a nine-speaker stereo system and an eight-inch colour touch screen. Very little is left to the options list, although polished alloy wheels are on there, as are climate-controlled seats. Is this 2015 Mustang being built by Ford in RHD for the UK market, or is a post-production conversion from LHD, carried out in the UK? It's being built in RHD for the UK market.